Subaru of America is committed to being a leader in environmental initiatives while continuing to reduce our own footprint. Being green isn't a trend. It's who we are and what we stand for. At Subaru, all of our vehicles are built in zero-landfill plants, which means that all waste is recycled or turned into electricity. Since 2004, our manufacturing plants have not sent any waste to landfills, because we protect what we enjoy. Subaru vehicles last a long time. That's why 96% of Subaru vehicles sold in the last 10 years are still on the road today. We love nature, so we take extra steps to preserve it by building vehicles that produce lower emissions. Subaru Partial Zero Emissions Vehicles help protect the environment by reducing smog-forming emissions to nearly zero. All claims based on original content Subaru.com. Based on Polk U.S. Vehicles in Operation registration information for MY 2001-2013 as of January, 2013. PZEV emissions warranty applies to only certain states. See dealer for complete information on emissions and new car limited warranties. Sometimes making the right choice means you might have to break a sweat. 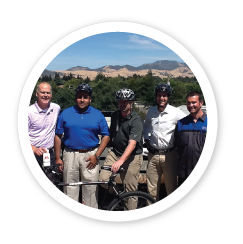 Many of us here at Diablo Subaru of Walnut Creek go the extra commute mile...by bike! That's right, as part of our green initiative we are taking to the streets on two wheels. Like most Subaru owners, we care deeply about the impact we have on our planet and when we're not out exploring the environment by Subaru on our days off, we do our best to preserve it by commuting when we can via the original no-emission vehicle: bicycle. The Greenest Commute; it's who we are. Scott McAllister (General Manager) - rides a LeMond road bike. He also has a Trek mountain bike and a thick framed Fiore tandem. "My commute from Pleasant Hill to Diablo Subaru of Walnut Creek is only 3 ½ miles, and takes less than 15 minutes. Driving takes the same amount of time due to lights and stop signs. My bike commute is about 20% on streets, 80% on the Canal Trail, which is a multi-use trail that runs through both cities. I find the cycling commute to be invigorating, with the wind blowing in my face. On my way home, I try to push it a little, and just before my house, there is a small challenge hill to welcome me home!" Dionysios Tsirkas (Sales) - Major, avid cyclist. "Currently enjoying road cycling around Napa County and mixing it up with a tri-bike on occasion too! I have been riding regularly for over 10 years and thoroughly recommend cycling regularly to all Subaru owners?.Have a good ride!" "My commute is from Concord/Clayton border 40% streets, and 60% Canal Trail. My 9 mile commute takes 45 minutes, about the same time during school hours commute in a car. I like the workout, feel like I start my day awake and ready to focus on my job. The ride home is time to clear my mind from the day, and refocus energy to coaching soccer, my other passion in Life!" Asif "Adam" Chaudhry (Internet Sales) - rides a DiamondBack mountain bike. 6 block commute. REALLY! "I sell Subarus and with them I believe in doing good for the environment and subsequently for myself. Actually, my riding has a lot to do with what's good for me. Riding makes me healthy. It saves me time. It makes me feel vibrant and gives me energy to do more with life. Of course, getting around by bike is a green thing to do. And altruism does have its rewards. Frankly, I wouldn't mind saving the world." Darrell Grans (Service Advisor) - rides a Giant Sedona road bike. 7 ½ mile one-way commute. "My daily commute is from the foothills of Mt. Diablo in Concord to the North side of Walnut Creek, 7.7 miles. I decided to bike commute so I can begin and end the day with a workout, enjoy the outdoors on the trails and save on gas money. It also allows me to start and end each day clearing my mind and refocusing my energy."